The Bible relates that Jesus was, with God's help, able to raise Lazarus from death (John 11:41). Jesus wept upon visiting Lazarus' grave (John 11:35), and this illustrates how sentiment inspires action. All healers care about those who suffer, and caring relies on empathy. How do we come to empathize with those who suffer, and, conversely, how do our hearts often become hardened towards those we victimize? Most of us reject historically prevalent forms of prejudice, such as racism, sexism, and homophobia. If we aim to explore how our hearts become hardened, it may be more instructive to look at animal abuse, which is much more prevalent in our culture. Nearly all children have a natural empathy with animals, and (except children who have had traumatic incidents involving animals) children generally like animals. While adults consider children's kindness to animals a virtue, most adults wish to limit children's affections for animals, most likely because nearly all adults participate directly or indirectly in animal suffering and death. Many people, and many business interests, want to maintain animal use in agriculture, clothing, experimentation, hunting, entertainment, etc. In order to garner public support for these activities, animal use proponents emphasize the supposed benefits of their industries, and they denigrate the animal victims as well as the animals' human defenders. Why do so many people uncritically accept self-serving claims from animal-use industries? How do animal-loving children grow up into adults who acquiesce to or even endorse animal abuse? Many children, upon learning that hamburgers come from cows and that "chicken" is actually a part of a chicken, refuse to eat the meat. In many households, parents sternly reply that the child must eat the meat or forgo dessert. When this happens, most children resolve this conflict between their heart and their stomach by training their minds not to equate the meat on their plate with animals. However, as Christians we must acknowledge that whenever we hide the truth, we open the path to sin: "For every one who does evil hates the light, and does not come to the light, lest his deeds should be exposed" (John 3:20). 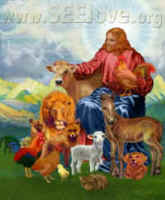 Those who live with farmed animals can face particular difficulties. It is easier to suppress mental images of animals when one only sees flesh under cellophane; children on farms must interact with and come to know the animals who will be killed and eaten. I think that an important component of the 4-H program is to transform children from animal lovers into animal killers. Many 4-H participants take infant animals and raise them to "market" size. The children care for the animals, and often the children and the animals develop strong emotional bonds. The children and the animals reciprocate affection, and they trust each other. Then, many children experience an emotionally traumatic experience that will likely forever change their attitude towards animals. Even though a given child has understood, intellectually, that the animal would be sold for slaughter, present-oriented children usually think about this unpleasant prospect only when that day arrives. On that day, a child who has bonded with the animal bids a tearful farewell (often finding a private place to emote since adults often express little sympathetic understanding) to a trusting, loving animal, who is oblivious to the betrayal.4 Subsequently, the child will likely be either wracked by guilt and self-loathing, or (more commonly) will come to see all farmed animals as "things" meant to be slaughtered and eaten. Similar to institutionalized animal abuse, institutionalized human abuse typically involves demonizing victims, a common manifestation of the scapegoating process. Demonizing victims helps quell natural human empathy by using terms that rob victims of their individuality. For example, killers during the Rwandan genocide called their victims "cockroaches," and animal names such as "pig," "chicken," and "cow" are often used as epithets to express contempt. Importantly, humans choose these names to express disregard, because these are the animals that humans eat or harm in other ways. Demonizing people and animals compromises truth, and the consequence is injustice. Calling a person a "pig" depicts them as glutinous and overweight and ignores their full humanity. Also, using "pig" as an insult helps people forget that actual pigs are intelligent, sociable, and have individual temperaments.